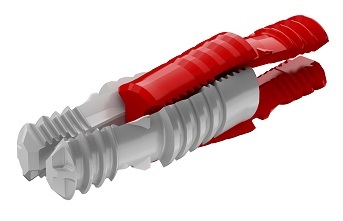 When it comes to innovation in the area of connectors and shelf pins, people are used to only seeing subtle changes in the evolution of how things are done. Well, bring on the revolution. Häfele America Co., one of America’s leading suppliers of furniture and architectural hardware components, has brought patented innovation where it hasn’t been seen in quite some time. Putting together small furniture, associated drawer boxes and the like can be an inefficient struggle with tools, clamps, glue, dowels, screws and frustration. And that’s even before cleaning up. With one inspired piece of hardware, Häfele has changed all this and more: Häfele’s ixconnect Spreading Connector SC 8/25. All you need is a few 8 mm holes to get started. Once assembled, furniture put together with the SC 8/25 won’t come apart. An additional, complimentary innovation being featured at this year’s AWFS is Häfele’s rear panel plug fitting which ensures drawer bottoms stay in place with no wobble or vibration by using its wedge design to create a simple, yet incredibly effective shim. Also shown at this year’s AWFS Fair is Häfele’s 3 mm shelf support system. With smaller holes in casework, 3 mm shelf pins offer a sleek, nearly imperceptible appearance. Even better, they can actually sustain more weight than other 5 mm systems due to their patented, twin tooth anchoring system. The teeth on this German engineered innovation dig into casework and grip more as weight placed on the shelf increases. Available in a variety of designs for both wood and glass shelving, the 3 mm shelf support system is guaranteed to provide years of trouble-free performance.